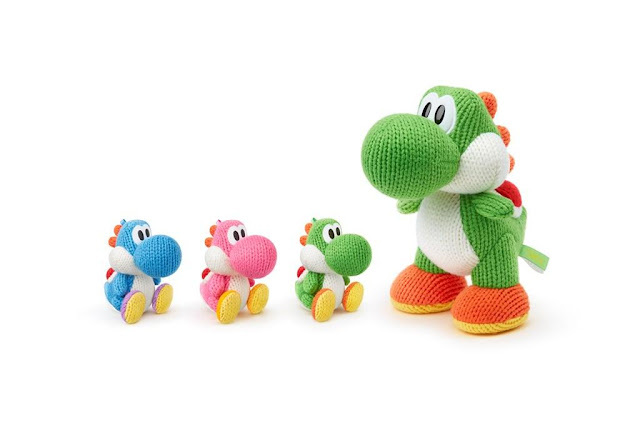 KoopaTV: MEGA YARN YOSHI is MEGA CUTE! Most people know that Yoshi's Woolly World already came out in Japan and Europe, with North America still waiting for an October 16, 2015 release that exists just to give Splatoon a lot of well-deserved time to itself. So Europe already has the miniature Yoshi amiibo. The miniature (or normal-sized, actually) yarn Yoshi amiibo come out the same day as the game in America. Yoshi's Woolly World is going to be $50 (like Donkey Kong Country: Tropical Freeze), or $60 for a bundle of the game and the green yarn Yoshi amiibo. You can buy blue and pink separately for $17 each. Again, Europe already has all this. But they don't have the MEGA YARN YOSHI. Europe is getting it November 27, 2015. Meanwhile, America gets it November 15, 2015! That's way earlier and should make up for the previous release discrepancies, right? Now, here's the catch: MEGA YARN YOSHI (by the way, the capitalisation is all my doing and not official syntax) is.... $40. Yeah, the price of a full 3DS game. And according to the press release, it does the same in-game functions as a normal-sized yarn Yoshi amiibo. So basically, you're paying $23 to make the amiibo plushie-sized with no other benefits. However, normal plushies don't go for $40. You can buy the Ludwig Von Koopa plushie that I enjoy for only $12! So why is it priced so high? Could it be that Nintendo is actually paying attention to supply and demand like I asked them to? I concluded that amiibo are obviously underpriced. Now Nintendo is raising prices (though in large part to cover the increased materials costs — this is real yarn!) to try to reduce the amount of people willing and able to buy the amiibo. That can only be a good thing to fight the second-hand market. By the way, I don't really know much about Yoshi's Woolly World since E3 2015. I've been purposefully avoiding information about it, 'cause spoilers and all that. So is MEGA YARN YOSHI actually a thing in the game? Is it related to Yoshi's New Island with its Mega Eggs? Is it a mega evolution? Don't let me know 'cause it's probably a spoiler. It's more fun for everyone if I'm left ignorant on this. So what should you let me know? Your thoughts on if you'd get a MEGA YARN YOSHI or not! I mean... I want some sort of yarn Yoshi amiibo. Whether it's MEGA YARN YOSHI or not is unclear. But it's obviously the go-to amiibo for cuddling. Ludwig loves cute plushies, such as himself in plushie forme. They're some of the best things money can buy, though under normal circumstances he'd never pay for a $40 plushie. He's torn on this issue. He hopes the yarn amiibo don't get torn up like his brain is. You should help him out. Ludwig hasn't gone amiibo hunting since Splatoon came out. Ludwig's Kirby plushie is actually world-famous. Ludwig also has Koopa Troopa plushie minions! And you don't buy a lot of plushies?! Your soul puts the "hard" in "Alienhard". Tsk. ...if a little one my mom crocheted counts, I'm up to three. I think you should fix that whole situation, Alienhard. I spent way to much on things at this point so I do not think I will be going for the Yarn Yoshi amiibo, whatever size. But it is adorable anyway. What WOULD your plushie-spending budget be? ...On that note, what's your budget for makin' 'em, anyway? Hey, my collection was built over months/years. Also for the last question, it depends how detailed. When did I get my Kirby plushie...? Like... six years ago, I think? I believe that's when I started having plushies. I had plushies going above $80. Depends on size and detail. Wow. What sort of materials did you use for that? Gold? I pour tons of hours into sewing them. Many of them are done completely by hand. You should see other plushie commissioners on Deviantart. I don't go out of my way to browse people's plushie stuff. When it comes to buying I weigh in if it will be hard to find later, if I can delay it or if I really want to support something. I got my Splatoon shirt from Nintendo World because I know how that store works and things will not be there all the time so I had to get it as soon as I saw it. I looked up the Splatoon shirt afterwards and it really is a Nintendo World Store exclusive (also has New York in the back, showing it is meant to be sold in the NY store) so I made a wise choice. I visited a month later and they still have in stock so it looks like they are stocking them well for the time being. I preordered the next wave of Splatoon 3 Pack Amiibos for obvious reasons. I have the entire Wreck-it Ralph Disney Store plush collection as well as the Calhoun limited edition doll because I like that movie and want to support it in any way I can. This was before I met my significant other so I had money to burn. I also usually will go on opening weekend to movies to help contribute to the box office because opening weekends is when it most matters to the industry. The later it is, the more the ticket prices go to the cinema itself. Otherwise I am good at delaying gratification. I really do not buy plushies monthly, just an exaggeration. Well by opportunity cost I meant the time it takes to make the plushie when you could be doing other things (like making money). But your discussion points are good, too! Personally, I'd rather support my local cinema than Hollywood, but at least you're thinkin' about things like that, so that's good. Calhoun is already opened out of her box and the box has some slight damage due to antics with my sister so the value is probably much less. No plans to resell her. As for Hollywood I am pretty sure it is people lower on the hierarchy who suffer first and get fired so it is employees such as the animators/special effects artists rather than directors, actors, etc who will suffer most from bombed films. Of course I do not support obviously crappy films just because someone will lose their job, there needs to be some effort in the film. We both contribute to the household. As for opportunity cost, I prefer thinking more about the art of the plush itself rather than the money in the long run. ...Ugh, I guess you're right about that hierarchy. In the business world, the skilled people lower in the hierarchy are usually pretty safe (since they're in short supply) and it's those useless middle managers or the high profile c-suite folks who are most exposed to suffering.